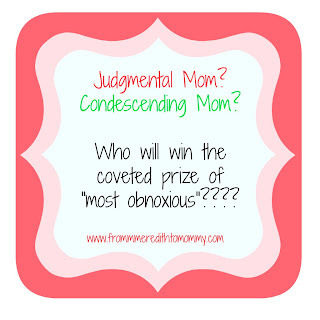 From Meredith to Mommy: Condescending Mom v. Judgmental Mom...I Think We Have a Winner! 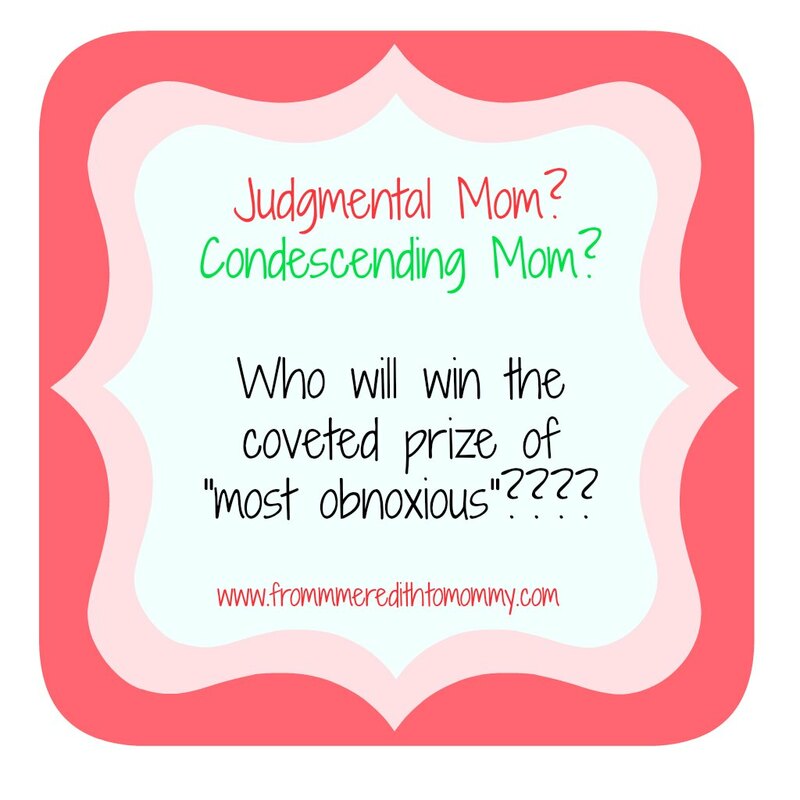 Condescending Mom v. Judgmental Mom...I Think We Have a Winner! Last time we were at the mall (ahem, festival), shopping for Madison's new seasonal wardrobe (she's fancy like that) I almost picked up a new mom friend, but chickened out. Today we went back to the mall, not to buy clothes, but because I actually realized I overbought t-shirts for Madison, and I needed to return a few "filler" pieces. I got to chat with another mom while waiting in line at Old Navy and realized she was the kind of mom I would not want to pick up. I thought that on my list of "mom types to avoid", that the number one type was "Judgmental Mom". Don't get me wrong, I'm still not putting those moms on top of my friends list, but today's condescending mom was so obnoxious, I think she may have pushed her category into a tie for first. I had both girls in the double stroller and was chatting with them - just silly stuff - as we waited our turn. There was a surprisingly long line and only one person working up front, and every customer seemed to have an issue. Reagan was babbling away and Madison was doing her best to make her laugh. Finally, we weren't last in line. A woman joined the line pushing a little girl. Madison is unbelievably outgoing and friendly and gregarious, and she'll not only chat with me, but she'll chat with anyone in sight. "Hi! My name is Madison. What's your name? Who's your baby?" At first the woman was completely friendly and chatted with Madison. She introduced Madison to her baby (Anna), who was pointing at Reagan saying "Baby!" The woman said to her child, "oh yes, but she's just a little baby! You are my big girl!" So of course, friendly person as I like to think I am, told this seemingly friendly mom that her daughter was adorable (she was) and asked how old she was. Turned out she and Reagan were only days apart! The woman was visibly shocked. First, I thought it was just that she reacted like most people do. Reagan is by no means unhealthy, but she is pretty tiny. Often people think she's younger than she is. That doesn't bother me. Nothing wrong with being petite. Then she told me that she never would have guessed Reagan was 14 months old, because "she hasn't said a single word! Does she talk at all?" Reagan babbles constantly. She has a lot to say, but so far, not much that anyone can understand. I really wouldn't count her as having any words. She's not an early talker like Madison was. But in a lot of ways, she's the classic second child. Crazy motor skills to keep up, later verbal skills because the first one talks for her. I'm not concerned, Adam isn't concerned, the pediatrician isn't concerned. But this mom was very concerned. And very condescending. You'll have to imagine her tone, because I can't replicate it in writing. But picture someone trying hard to sound humble/helpful/sympathetic/simpering....I don't know. Honestly, it was like a cartoon version of condescending. I'm not doing it justice in my description. So use your imagination. I must have looked confused, because she started listing all the woes that would befall a 14 month old who wasn't saying single, understandable, words (which, again, is not something we are concerned with. According to our pediatrican, if at 18 months she has NO words, we can consider the idea of maybe needing speech). She'd be a delayed reader! She might develop behavior issues from being unable to communicate her needs! She may have undiagnosed hearing disorders and was silently suffering!!! Then, because I was woefully unaware of how serious the situation was, she began to give me some super helpful tips. With a really concerned face and an attitude that seemed to indicate that she needed to step in and help this poor family before it was too late! You know, I think the reason Anna is so advanced (Really? Advanced? I am sure she is sweet and smart and wonderful, but I've heard one word) is that I really make an effort to talk to her. I talk to her all day! Maybe YOU could try that! You would be AMAZED! Since at this point I had relegated her to blog fodder (hey, thanks for the topic! ), I didn't follow my instincts and shut her down. I really wanted to see how far she'd go. So I merely raised my eyebrows. I mean, obviously your older daughter caught up. She's SOOOOOO cute by the way! Maybe you could try the same things with your baby? If you can remember what you did to encourage her to talk? Do you think you talked to her? I know it was a few years ago. Huh. Wonder how old she thinks Madison is. You can talk to her about anything! You don't need to worry about thinking of what to say! I tell Anna everything! Like, when we get dressed I tell her what she's wearing! And when she eats I tell her what she's eating! Oooh, wait, do you play with her? You can tell her what toys you are using! And did you know that babies like books??? They do! I probably read a book every day! I had to stop her, since luckily, it was my turn and I could focus my attention elsewhere. As I did my return - which was thankfully easy - she took it upon herself to talk to my poor, neglected child. (Ok, you're going to need to hear that voice again. Now, add "super fake wide eyes overly enunciated and slightly manic" to whatever voice you were using before). Hiiiiiiii. Hi! Hi! Hi! Baaaaaay-beeeeee. Baaaay-beeeee. That's you! Yoooooooou! See Mama! Maaaa-maaaa! Maaaa-maaaa! Reagan is not into strangers, and this woman was being so over the top that Reagan had stopped her babbling, smiling, and playing. She wasn't crying, but she was staring warily. Madison is meanwhile watching this with fascination. She looks at the woman like she's insane (thatta girl). The woman noticed and starts gesturing toward Madison. Oh! Your sister is a biiiiiiiig girl! Sissssss-ter!!! Can your sissssss-ter talk to you? Maybe your biiiiiiig sister will talk to you? Now my return is done, so I smiled and told the woman to have a nice day (again, silently thanking her for providing me with such awesome blog fodder). It was her turn now, so I figured her parenting lesson and language tutorial was over for the day. She could go home feeling like she'd really made a difference in the world by doing such a good deed. Just remember! Don't wait for school to teach her! You're her mommy! You have the most important job in the WHOLE WORLD!!!! Don't think of it as hard! Love it! By the way, I'm aware I have been a HORRIBLE blogger recently. For some reason I have had a really hard time getting the time to sit down and WRITE. I really don't like writing in short spurts, and big chunks of time when I'm not exhausted have been tough to find. But now that I'm actually caught up, I HOPE I'm back on track. If you miss hearing stories here, you can always check me out on Facebook! I usually have a moment to share a funny link or two! And don't give up - I have at least two great giveaways coming up soon!